Spring is here and glass days like this are on the rise. The dolphin have been especially attentive lately as we are all still making our way back from hurricane season. The Keys are looking good and there are still many people hurting, but our spirits and resilience are stronger than ever. Each time I am on the water and the dolphin come to bless us, I feel so grateful to be on this earth and share in the magical journey of discovery and dancing! The dolphin are dancing lately, putting on the show for us, as if saying "Delight Delight, live your life right! Dance with us tonight." Last night I went dancing with 3 of my really great girlfriends. 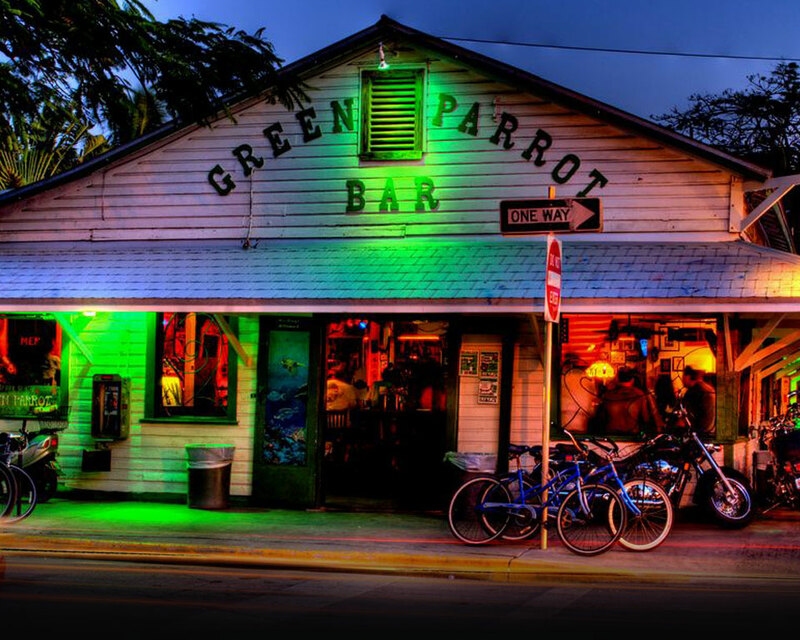 As we ended our evening, we were sitting in the window seat at the Green Parrot after a fantastic night of music and dancing and a beautiful memory came to me. I remembered sitting with my Mama in this very same window seat the last time she visited me before she left her Earth Suit behind and took that rainbow bridge to the other side of this reality. We went to the Parrot often while she was here after a day of playing first mate on the boat with me. She was so cute at 81 swinging her short legs to the beat, she stood only 5 ft tall, then suddenly bursting out like a bubble of joy really moving to the beat. She retold her stories of her and my Dad dancing there in 1945. Dad got stationed here in Key West in the Navy the day WWII ended. What a reward after all that misery he experienced while out in the Pacific. Mama shared how she and Dad courted during the big band era when they met in Palo Alto, California. There were many ballrooms back then for the big bands of the time to perform and that is where my Mom and Dad courted and danced the night away. I thank my parents for my sense of rhythm, what a true inheritance that is. At home in Key West, I remember the music was always playing and we learned to dance while standing on Dad's feet. I remember many a night that dinner was burned because Daddy danced Mama out of the kitchen where they forgot all else as the joy of the dance swept over them. Finally, Mama got a dinner timer with a rope to wear around her neck for whenever the mood struck Daddy to dance her out into the living room again. Having a brother for a dance partner made for a great childhood in and out of the house. The Navy bases always had great dance clubs and my brother Ron, and I won many a dance contest taking after Mom and Dad too. Mama even taught us dance while washing the kitchen floors in our socks. Dance has always been a part of my life. The Green Parrot was named the Brown Derby back in the 40's and was just outside of the Navy Base gate. Dad didn't get much time off the ship, so Mama would meet him there. During the war years, they didn't get much time to court before they got married in 1944 so they were making up for lost time by dancing every chance they could get. is my way of expressing my JOY! Who better to learn this from than the dolphin? In a profession like mine, being out in nature with all that mood and color therapy, the calming negative ions, and the peace of being out in the expanse of Mother Ocean, plus the joy of dancing with dolphin all day, I naturally want to celebrate and express my gratitude at the end of the day and dancing is my way of doing just that. In fact, the name of my business.... Dancing Dolphin Spirits Charters says it all. I truly dance with the dolphin as we dance your water spirit awake. The music is coming through the hull in the bow at the waterline and the dolphin feel every vibration. My plantar fascia on both feet have been torn quite a few times over the years as I beat my feet on the deck to the beat of my Mama's favorite Polka music. so she made me a mix tape in 1978 with all her favorites. She called it 'Mama's Polka Party.' I sure wish I could have it turned into a CD since the old tape stretches as you play it and it loses the quality. It's a cherished gift from my Mama and one of the dolphin favorites from years past. My Dad worked at the Sonar School in Key West and taught me early on just how dolphin see the sound up to a half mile away, so I am mindful to not play the music too loud, since they hear so much better than we do. I found I could bore the dolphin if I play the same tunes all the time, so I included other genres when I got the CD player, but that skipped every time I hit a wake wrong and no one enjoys that. So, I eventually graduated to the iPod for "myPod" and even better speakers than I have in my home. I watch the cues for how the dolphin are acting and try to play music according to them. They really do have a music mood just like we do. I owe all of this to my Mama and her big bright idea. On this Full Moon Sunday, we will take time to work with our crystals and precious stones in different ways to re-program them with your intentions for your life. We will commune with the dolphin and our crystals to attune to the high healing vibration of dolphin energy. When you go for a walk on the beach, you can find things from nature to place with your crystals in a mandala of intention when you find just the right spot for you to sit in your "deep listening" meditation. There will be time for sharing, journaling and meditating, as well as swimming, snorkeling and swimming like a dolphin. Please feel free to bring your own precious stones if you like or I will have a set for you. For more information or to register click Here. They are rebuilding hope, one home at a time. I've been out on the water, exploring the islands, seeing the fresh shoots of new growth. I can feel the spring awakening within me too. My feet do hurt today, but I am in my happy place after expressing my JOY with myPod of girlfriends. Pod-ly ness is next to God-ly ness Pod-ner. Very Truly Yours "the Dolphin DJ."